Regardless of the cause, cracked parging can allow water to permeate your foundation and lead to further deterioration of your exterior finishes. It’s also important to note that anytime the home’s foundation is compromised, there is the potential for water to seep into your walls. This can result in the growth of mold and mildew, and interior water damage as well. Crumbling of the Parging: If your parging is crumbling or flaking off, you need a professional to ensure that it’s doing its job. While parging does add a pleasant finish to your home, it also serves an important function in preventing damage to your home. Crumbling can occur as a result of simple aging, poor mixing of materials or improper application. 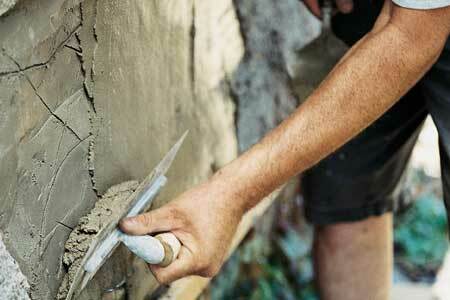 Making sure that your mortar coating in good repair is crucial to maintaining your home’s structural integrity. Settling: Foundation damage isn’t always easy to spot. While inspecting a property we look for windows and doors that no longer close properly, cracks in interior walls, and buckling walkways or decks. These issues may mean that your foundation has settled or shifted – and that could require attention in order to prevent further problems down the road. If your home’s foundation is showing any signs of disrepair it’s important to address it right away to prevent costly complications later on. Don’t hesitate to give us a call for a consultation today. Trust the expert team at J & J Coatings for sound advice and quality workmanship that is second to none.